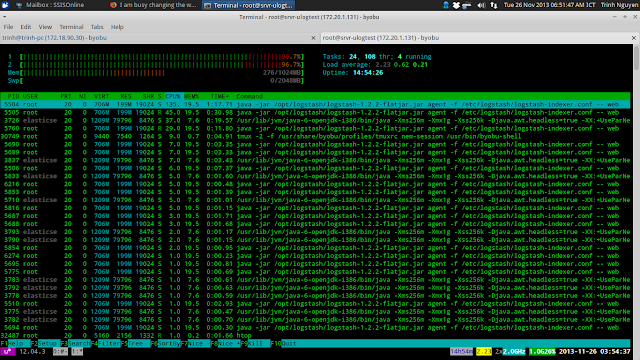 As you can see, what logstash does is only move logs from redis to elasticsearch. There is no way it needs a lot of cpu power as I pointed out in the previous blog post. What's wrong? 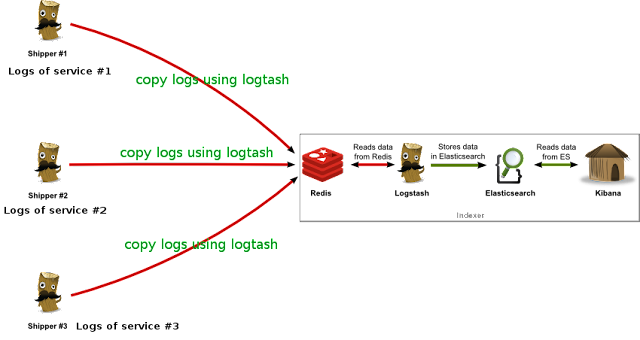 After a while searching around Google and digging the logstash documentation, I found out the reason. It is the "embbedded" option in my configuration. redis-server is the Redis Server itself.redis-cli is the command line interface utility to talk with Redis.redis-benchmark is used to check Redis performances.redis-check-aof and redis-check-dump are useful in the rare event of corrupted data files. "Effective Django" is a great tutorial made by Nathan Yergler which was presented at PyCon2013. This maybe the best thing to do this weekend. "Practice makes perfect", you know. List all the files in a folder that are owned by a the user "trinh", with permissions "-rw-r--r--"
+ "rw-" : the next 3 characters is the owner's right, can be translated to 110 which means 6 in decimal system. + "r--": next 3 characters is the group's right, is 100 in binary and 4 in decimal. + "r--": the last 3 characters is the other users's right, 100 in binary, and 4 in decimal. So, "-rw-r--r--" is 644 in decimal system. $ git add -A . $ git commit -m "Before deploying"
$ git commit -m "Updates"
The memcached service will run at 127.0.0.1:11211 by default. 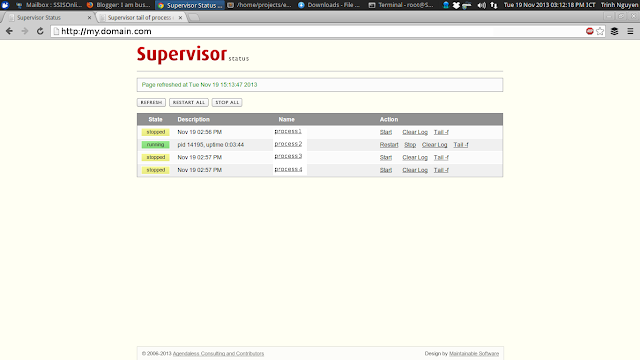 Supervisord, a process control system, has a simple built-in web interface to help you manage processes. It is just so great!!! "The Public Domain Review is a not-for-profit project dedicated to showcasing the most interesting and unusual out-of-copyright works available online. All works eventually fall out of copyright – from classic works of art, music and literature, to abandoned drafts, tentative plans, and overlooked fragments. In doing so they enter the public domain, a vast commons of material that everyone is free to enjoy, share and build upon without restriction. The Public Domain Review aims to help its readers to explore this rich terrain – like a small exhibition gallery at the entrance of an immense network of archives and storage rooms that lie beyond." Restart, and then I can only need to type 'projects' to change my current directory to the project base. Restart and log-in again to see. 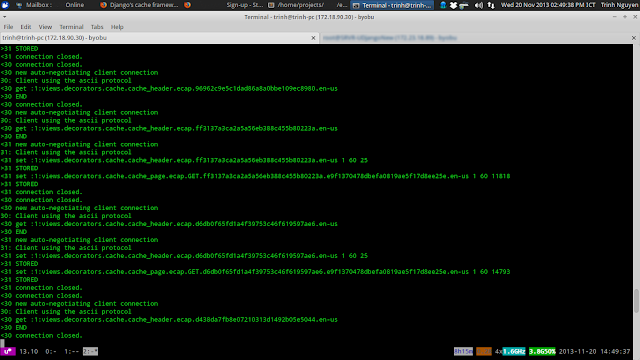 xmodmap -e "pointer = 1 2 99"
Exec=xmodmap -e "pointer = 1 2 99"
Restart and log-in again to see it work. The following packages have unmet dependencies: mariadb-server-5.5 : Depends: mariadb-client-5.5 (>= 5.5.33a+maria-1~saucy) but it is not going to be installed Depends: mariadb-server-core-5.5 (>= 5.5.33a+maria-1~saucy) but it is not going to be installed E: Unable to correct problems, you have held broken packages. The reason for this issue is the version of MariaDB is mismatch with the version in the Ubuntu repositories (click to read more about this). + Read the 'cred' file to verify if that user has the privilege. "No society in which these liberties are not, on the whole, respected, is free, whatever may be its form of government; and none is completely free in which they do not exist absolute and unqualified. The only freedom which deserves the name, is that of pursuing our own good in our own way, so long as we do not attempt to deprive others of theirs, or impede their efforts to obtain it. Each is the proper guardian of his own health, whether bodily, or mental and spiritual. Mankind are greater gainers by suffering each other to live as seems good to themselves, than by compelling each to live as seems good to the rest." ~"On Liberty" by John Stuart Mill.